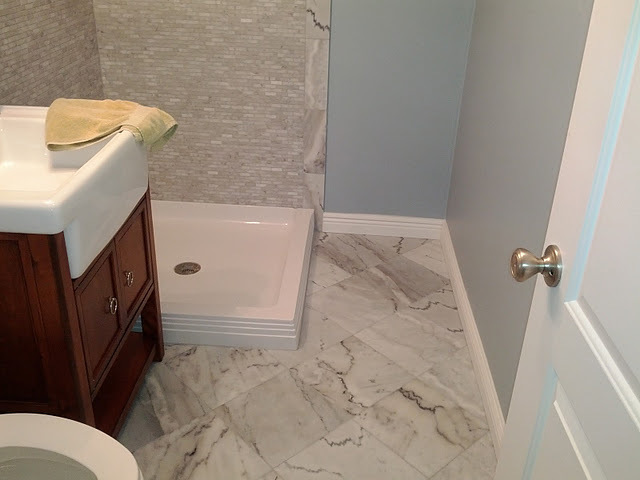 We finally finished installing all of the trim in the basement - including these baseboards in the bathroom. Still plenty of work to do including most of the caulking and painting, but at least the construction phase of the space has concluded. There are (obviously) a few more touches like shower doors to finalize, so we'll get those things sorted soon. Funny how projects like this go like nuts for weeks/months, but as soon as it is "good enough" to occupy, everything slows down. Once we moved in and unpacked the toys it seems like I forgot that I had all this extra work to do. At least with caulk and paint, I can do it in batches with one section at a time. With Spring right around the corner, I have just a few months to get this done or else my attention will wander to the garden and backyard. Time to focus.